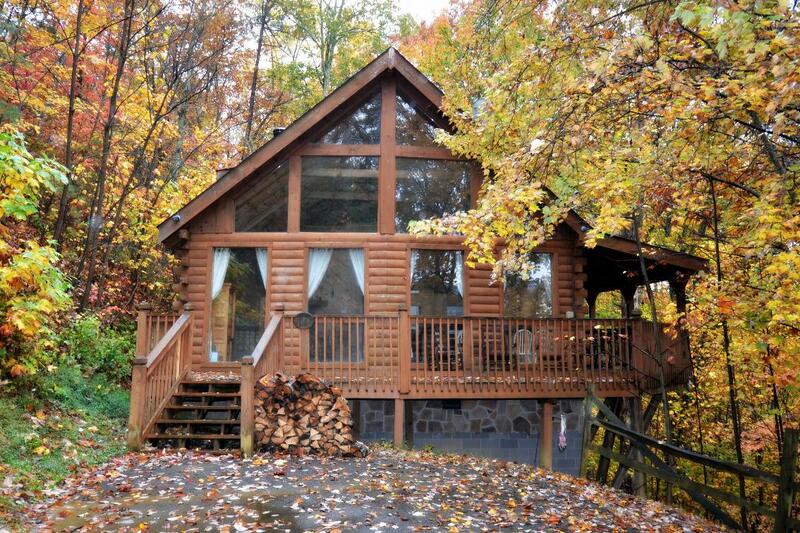 Wild Turkey located in Shagbark Resort, which is a 1400 acre mountain filled with beautiful mountains and wildlife, is the perfect get away cabin. 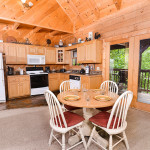 Being located right on the outskirts of Pigeon Forge, Tennessee, Wild Turkey boasts cathederal ceilings, floor-to-ceiling windows, and pool access in the summer months. 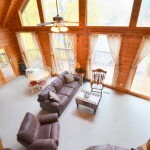 Lush woods surround this private mountain retreat, making it scenic, relaxing, and perfect for taking a break from the everyday grind. 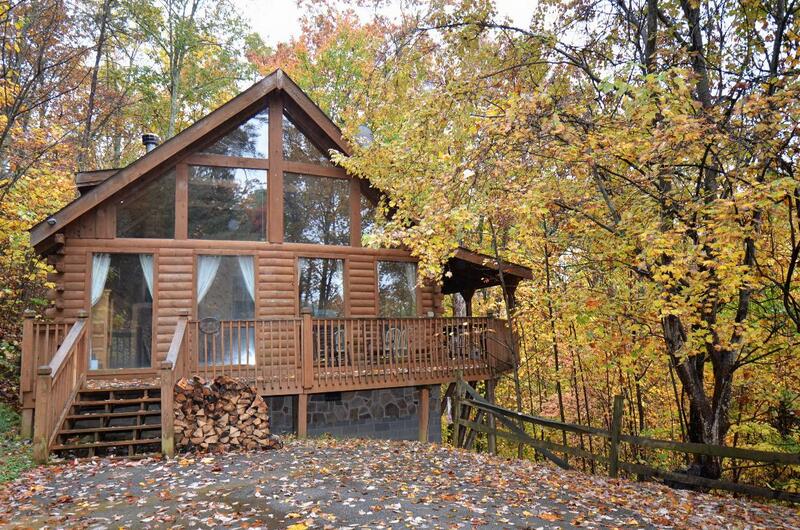 The comfort and ease of Wild Turkey begins as you pull up. 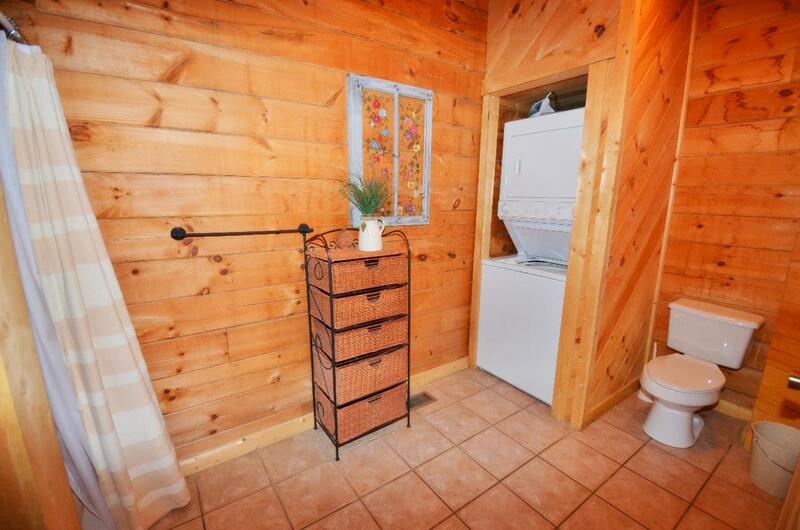 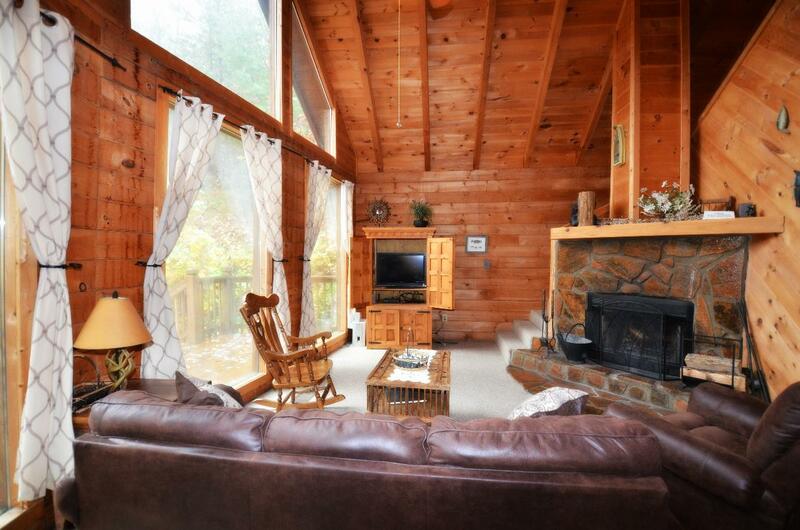 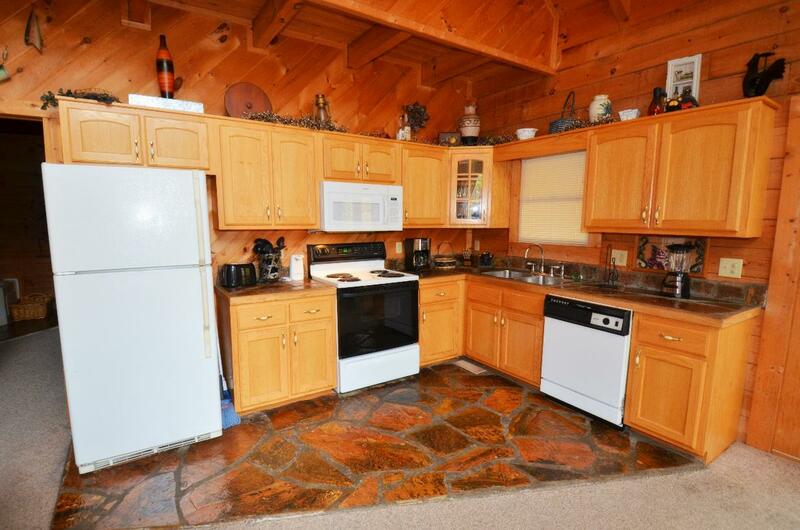 A paved driveway and flat, paved parking make unpacking simple at this cabin rental. 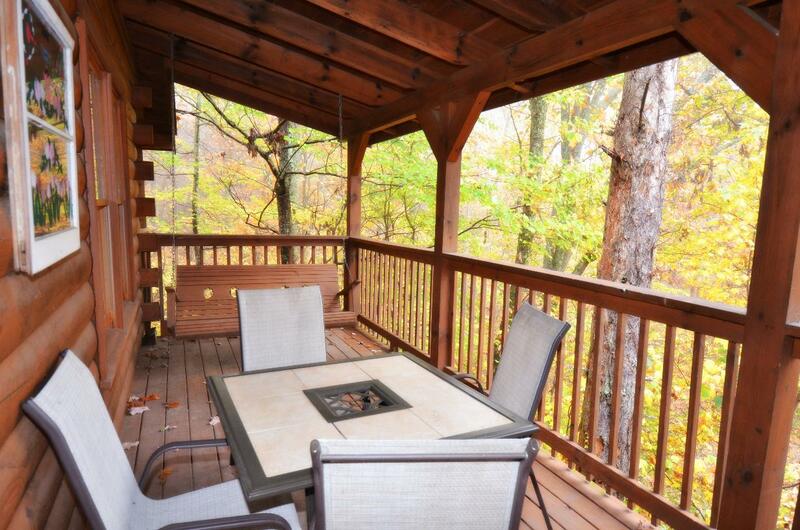 A wrap around deck and large windows will greet you, along with the beautiful surrounding trees. 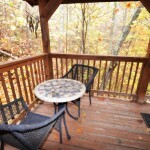 On the deck, there are many spaces for enjoying the great outdoors. 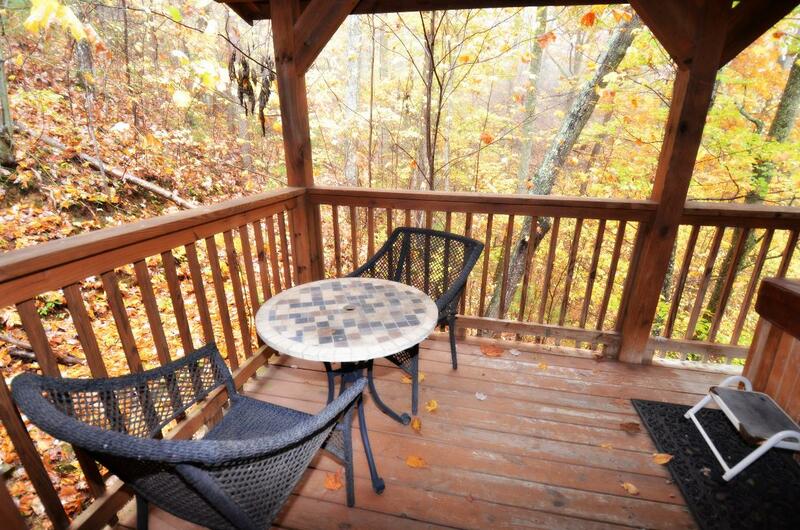 Sit back and relax in the rocking chairs along one side of the deck, or head around the corner to spend an afternoon napping or reading on the porch swing. 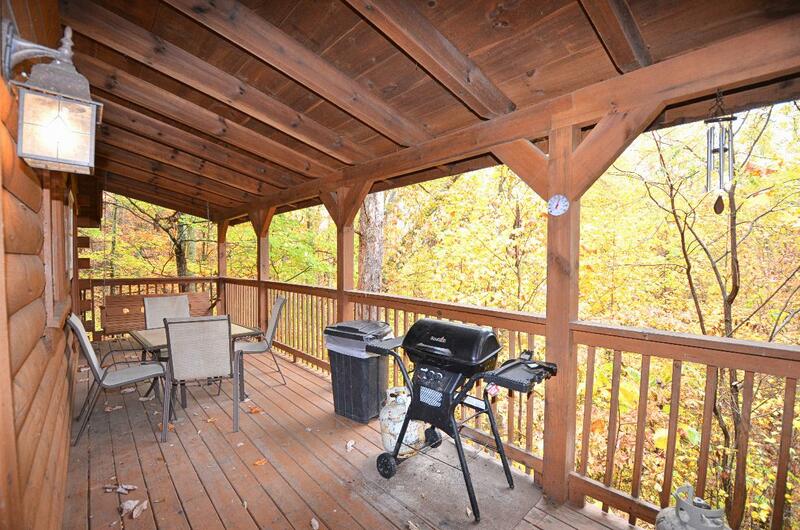 On nice days, use the gas grill to cook up juicy burgers, steaks, or hot dogs and sit down for a family meal at the outdoor dining table. 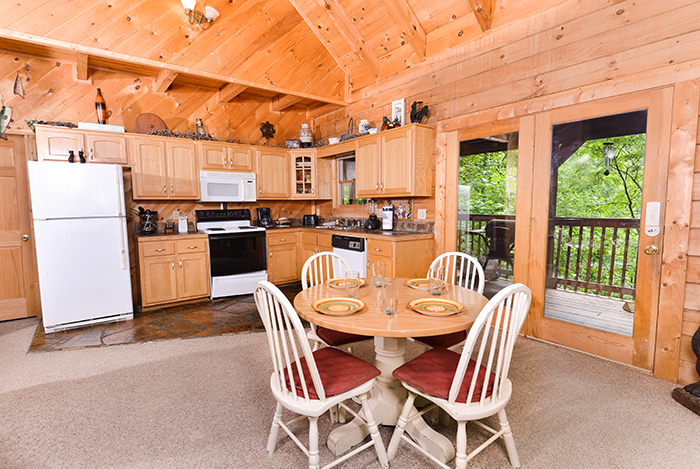 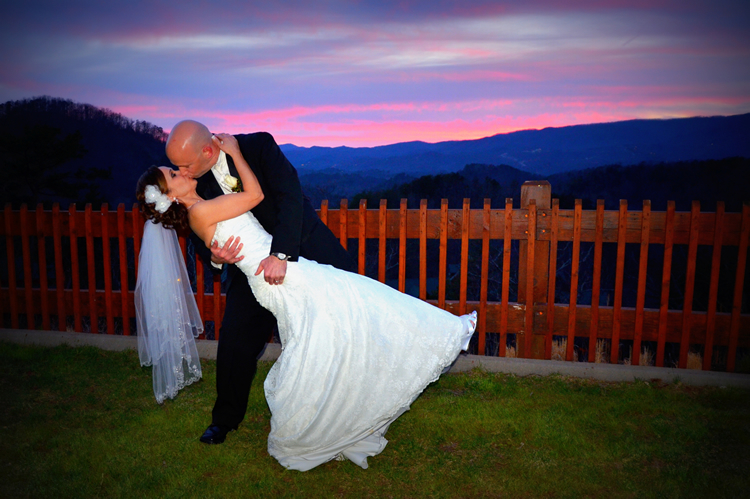 The gorgeous Smoky Mountain woods surrounding you will provide the perfect backdrop for a really fantastic meal. 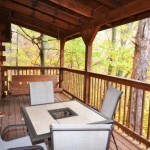 The outdoor spaces continue on the covered deck off the master suite. 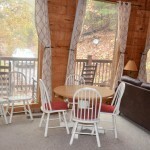 Bistro-style seating for two makes for a great spot to have your coffee in the morning or a romantic place to have a candlelit dinner for two under the stars. 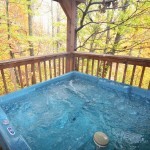 The outdoor hot tub here can be utilized year round. 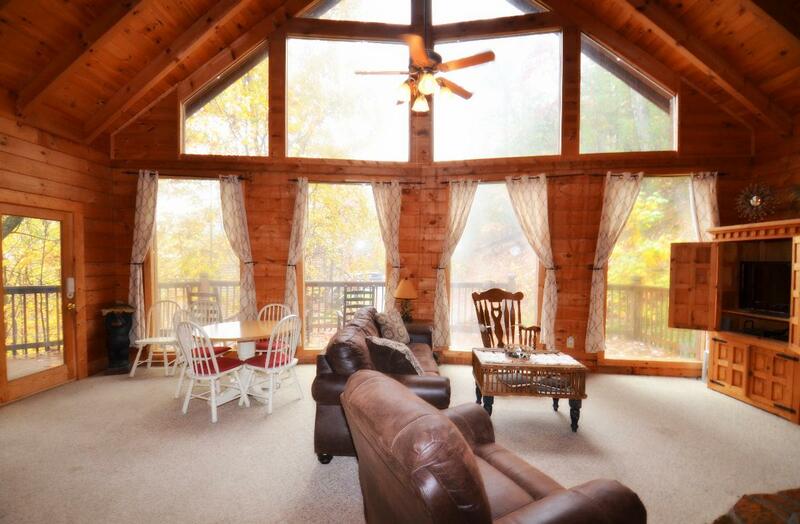 Enjoy snowy Pigeon Forge evenings in winter, the vivid autumnal hues in fall, and the lush greenery and wildflowers in spring and summer while soothing muscles and relaxing. 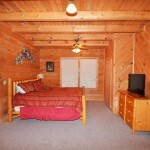 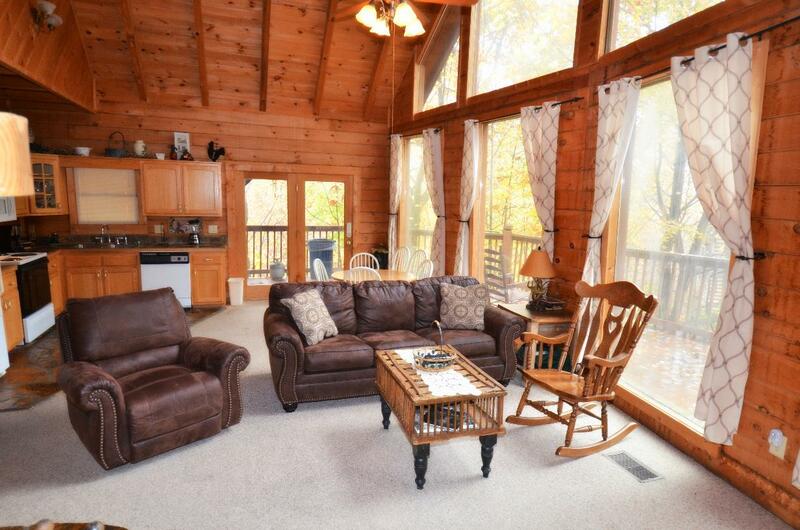 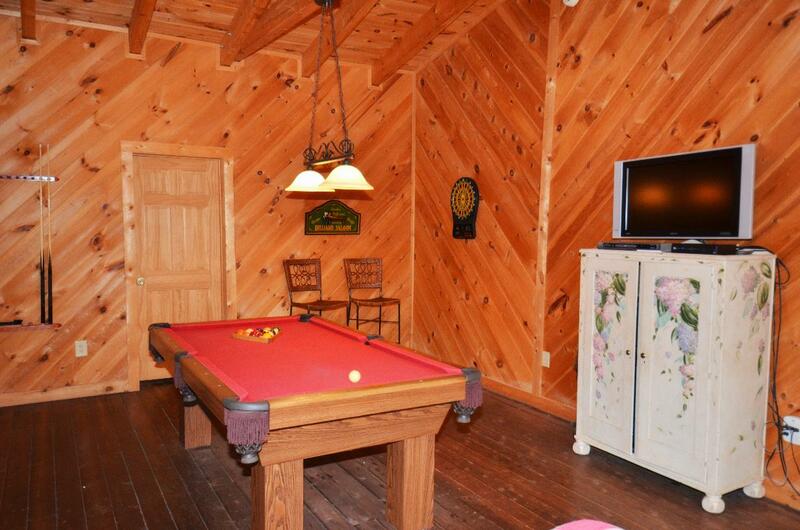 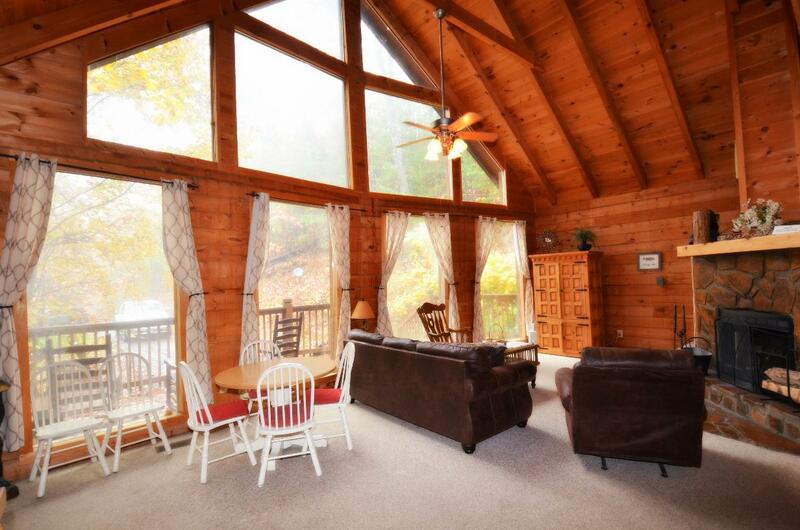 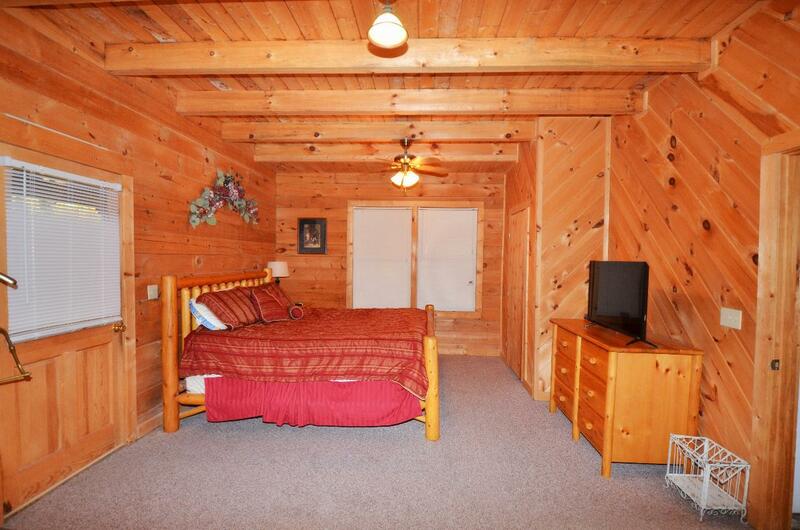 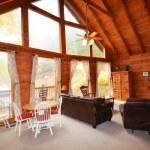 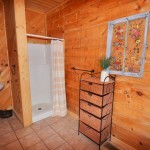 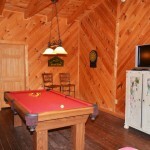 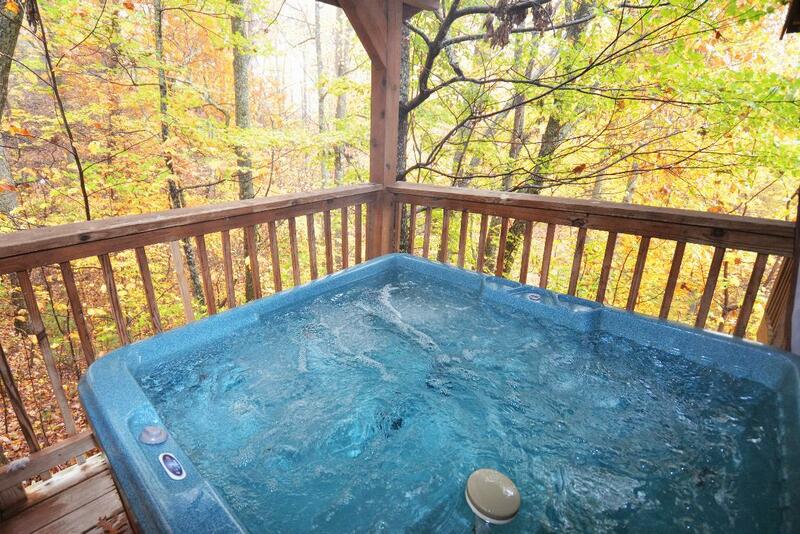 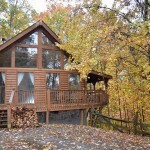 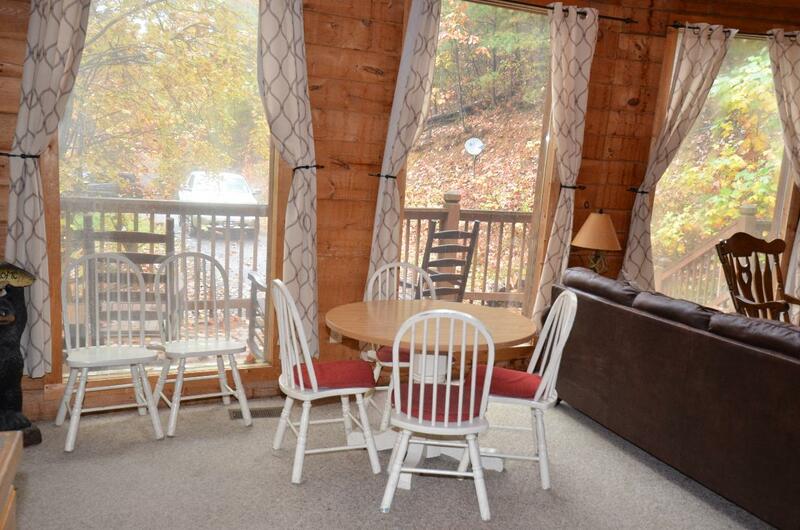 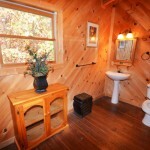 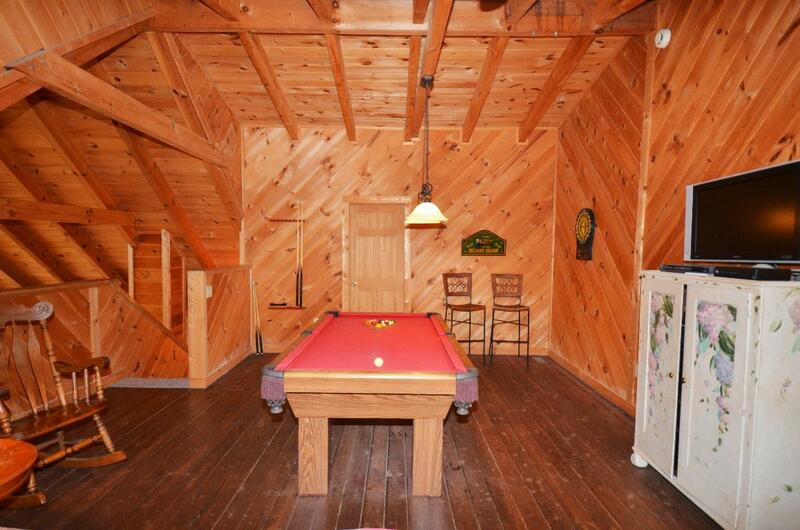 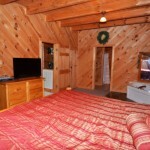 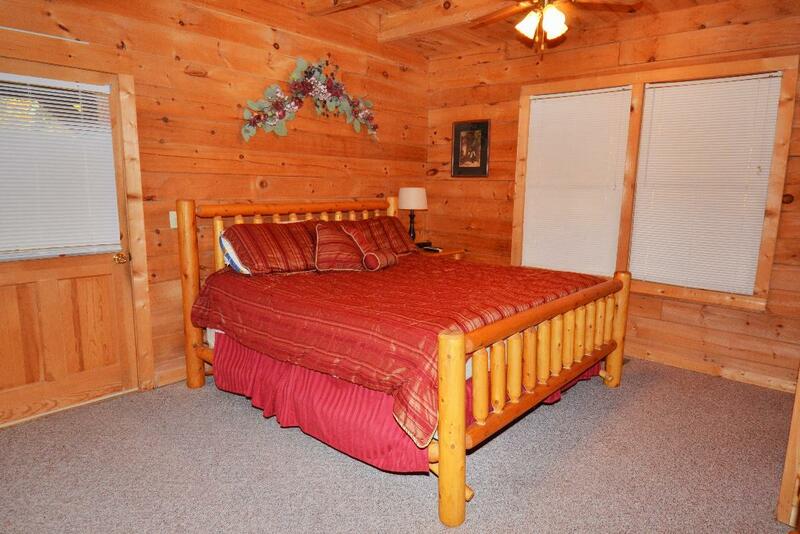 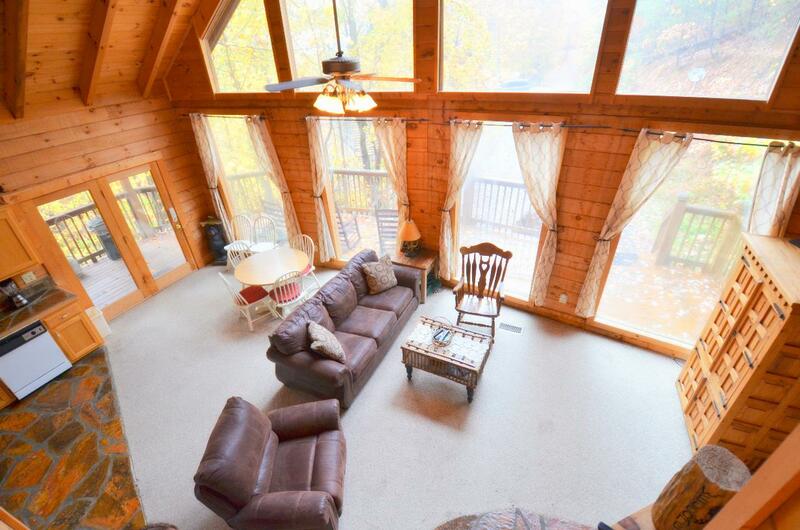 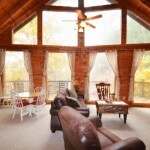 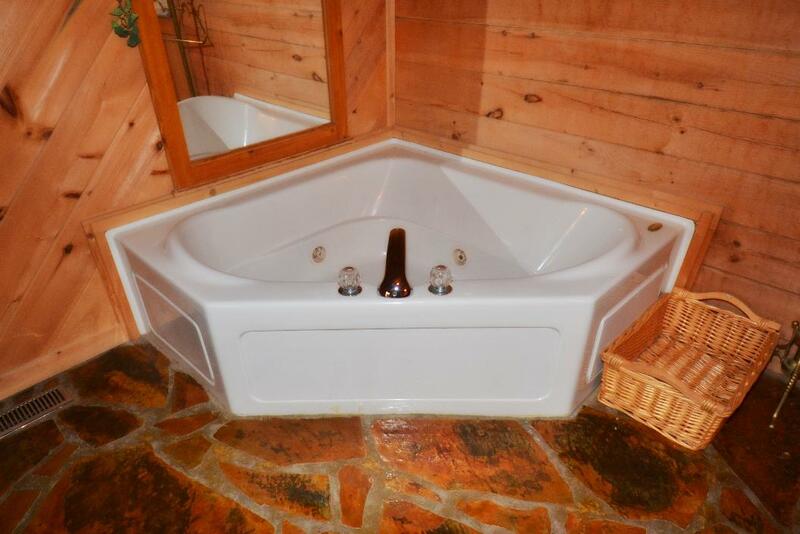 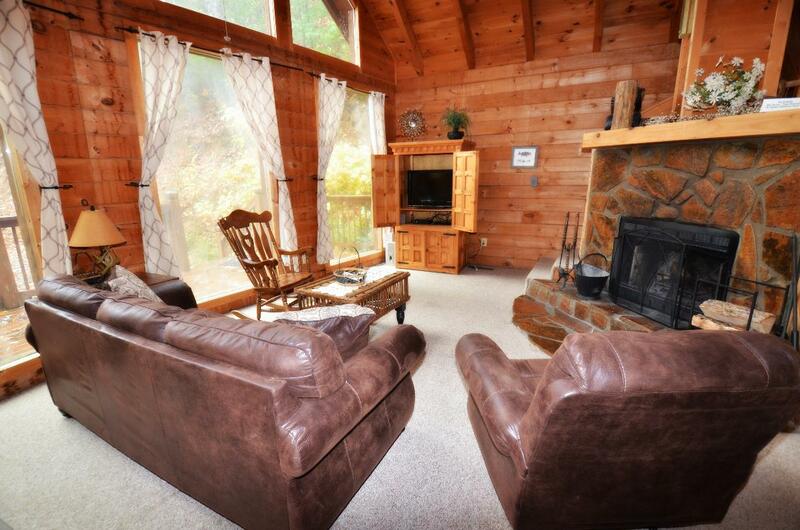 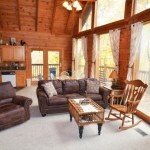 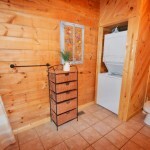 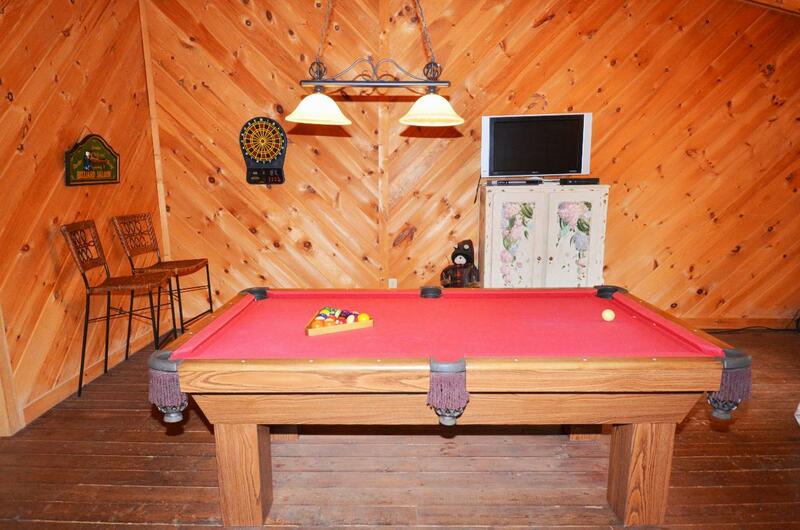 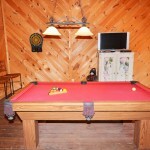 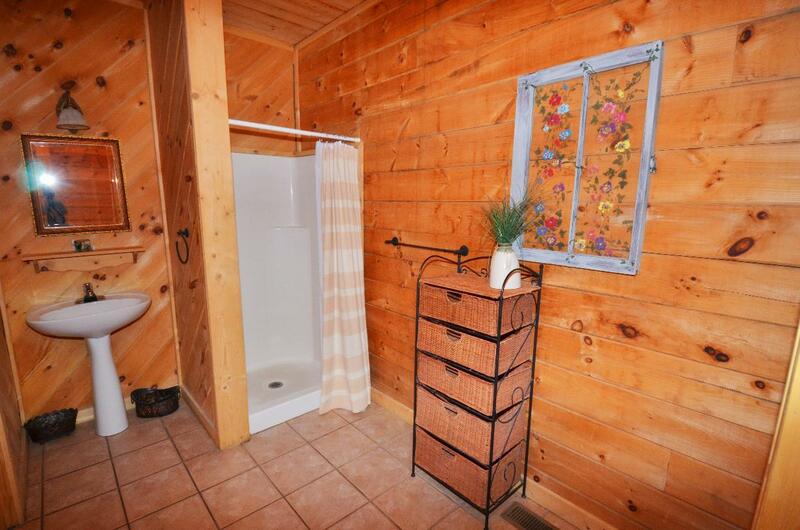 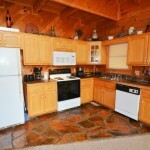 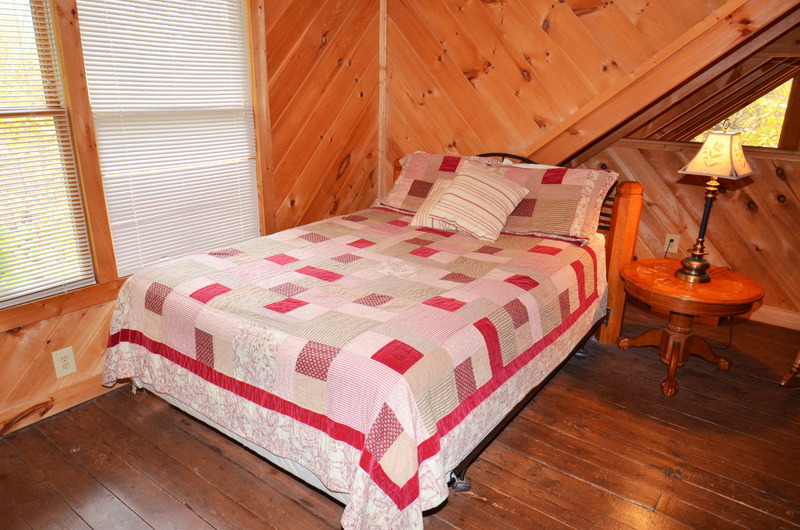 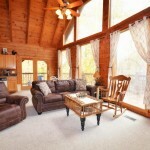 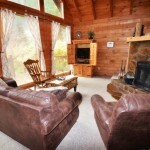 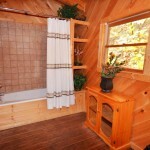 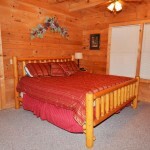 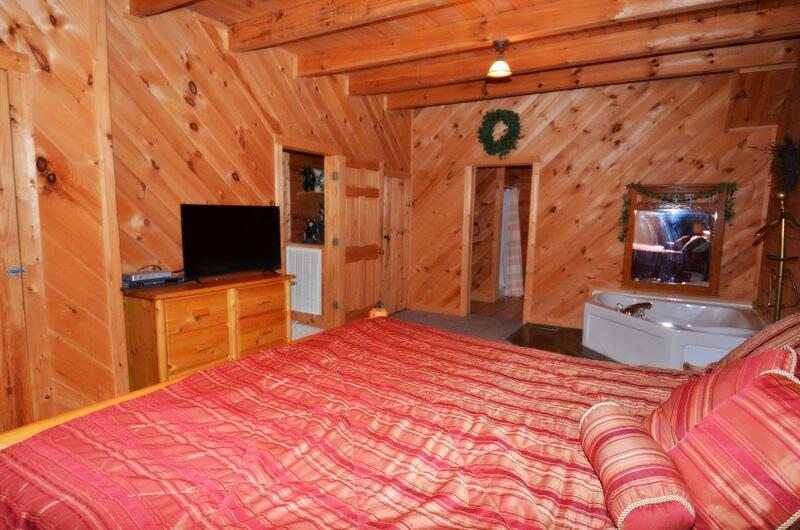 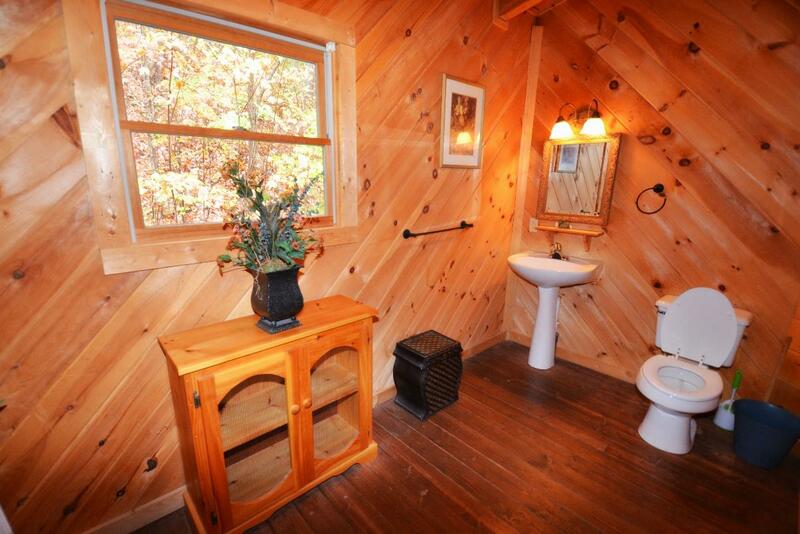 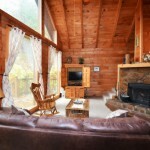 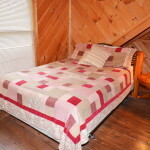 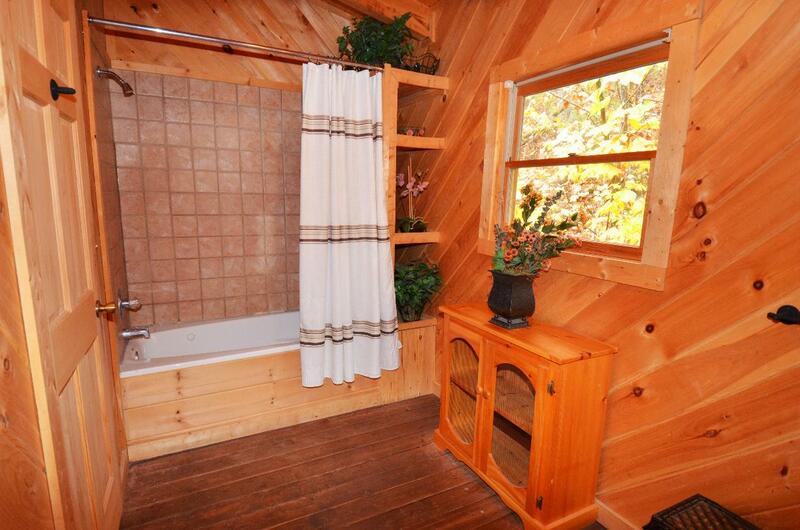 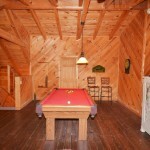 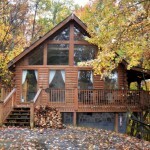 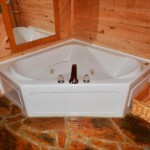 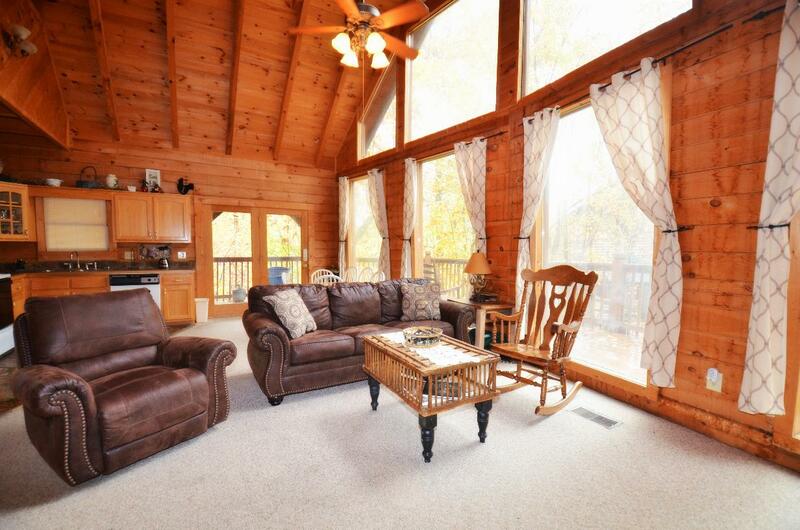 Reserve this cabin today…..